New research from Avalere finds that the amount of prescription opioids sold across the US declined by 11% in 2017 compared to 2016. States that passed laws setting limits on opioid prescriptions in 2016 experienced steeper declines in opioids sold than the national average, with decreases in these states ranging from 13% to 25%. Maine, which passed such a law in 2016, had the largest decline at nearly 25%. Opioid fill limits set restrictions on the quantity of opioids that can be prescribed by a physician to a given patient over a specific period of time. By the end of 2016, 7 states—Connecticut, Maine, Massachusetts, New York, Pennsylvania, Rhode Island, and Vermont—passed laws limiting opioid prescriptions to a 3- to 14-day supply or limiting the morphine milligram equivalent (MME) amount of medication that can be prescribed. 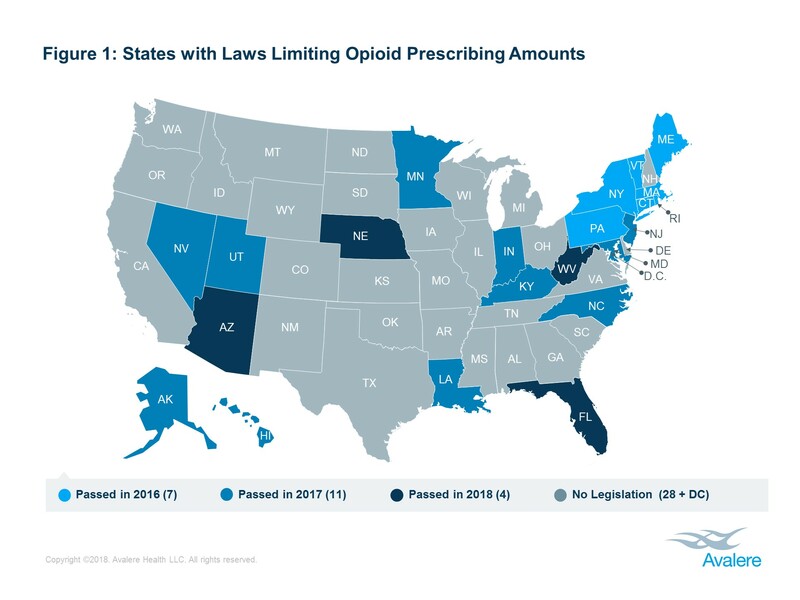 As of today, 22 states have enacted legislation to limit opioid prescribing amounts (Figure 1). In 2017, the amount of opioids sold in the US declined by 11.0% from 2016 (Table 1). Maine, which enacted a law in 2016 to limit the MME that could be prescribed, had the greatest decline in the US at 24.8%. Avalere researchers found that all states but Idaho had opioid distribution levels decrease. In Idaho, opioid distribution amounts increased 59.7%. A closer look at the data shows that the amount of oxycodone sold in Idaho rose nearly three times in 2017 when compared to 2016. Avalere analyzed data on opioid analgesics from the U.S. Drug Enforcement Agency’s (DEA) Automation of Reports and Consolidated Orders System (ARCOS), which tracks the distribution of controlled substances from their point of manufacture, through drug distribution channels, and ultimately to point of sale at the retail or dispensing level. We excluded buprenorphine and methadone from our analysis because they are used largely to treat opioid use disorder. We also excluded alfentanil and remifentanil because data was not reported for those drugs in 2016. We examined the grams of opioid analgesics per 100,000 individuals flowing through the drug distribution system as reported to ARCOS in 2016 and 2017, before and after the first laws restricting the amount or days’ supply of opioids were passed.